I don’t have a before photo. I worked on this a few years ago and didn’t know I would be blogging one day. This dresser is mid-century solid wood, it has tongue and groove drawers. It was once a boys dresser. It had covered wagons attached on two of the drawers that were decorative wooden pieces. This piece provides a good amount of extra storage. It was given to me by a friend. 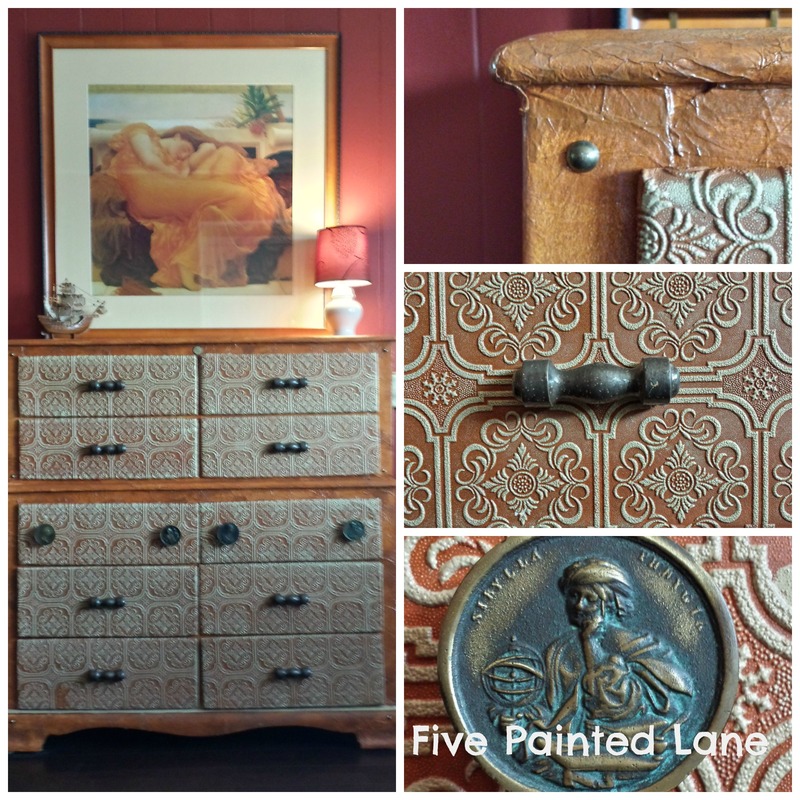 I wanted to redo the dresser in a way that complimented the artwork that hangs above it. It is special to me because my husband and I had it framed when we were engaged. The art, if your curious is “Flaming June” by Frederic Leighton, 1895. The frame has a lot of orange and rust colors. So I went with orange for the dresser in a red room. I used two techniques on this piece. 1) Paintable wallpaper: This was used on the fronts of the drawers only. It is textured and comes in white only. The textured part is the design that is all gold in the photo. It is raised and therefore three dimensional. They come in many cool designs. The major hardware stores carry this paintable wallpaper. I cut pieces a couple inches larger all around than the drawers. I used Mod Podge to attach it to the drawers. I stood the drawers face down to let it dry. Then I trimmed it to 1/4 inch and stapled it to the back, lip part of the drawer. Paint it completely with your background color. Use a small stiffer type of brush because the the depth of the design you may do some dabbing, stabbing at it type of stuff. This is where I used orange. Let this step dry completely….crickets chirping… Next you will need a very smooth, spongy type of small roller brush. With paint on the brush roll off the paint until you have a small amount. Then go over the top lightly. The idea obviously is to just get the paint on the raised surfaces only. This is where I used a shiny gold. 2) Tissue paper technique: This was used on the rest of the dresser. (not the drawers, see above) I had previously only done this on walls. This technique is great for walls with imperfections it hides things nicely. It also worked well on the wood dresser too. Keep in mind the top is just for decorations, a lamp, etc. I wouldn’t try this on a desk top I am sure it would not hold up. What you need in addition to paint and a brushes is white gift wrapping tissue paper. The kind you place in a gift bag. ( Not bathroom tissue, that would just make an awful mess.) Paint a one foot square area, wad one piece of the paper into a tight ball. Unfold it and smooth it out. It will be wrinkly. Place it on your wet paint and paint over it. You can’t mess this up. It is so easy. If you see an edge or an area bare just tear a smaller piece and stick it on there. In the small areas also tear the sheet into smaller pieces and do the same. Work while the paint is wet. You will end up with a wrinkled and, I think, leathered look. After it is completely dry you can go lightly over the top with a darker paint. I used a bit of dark brown on a cloth and picked up the raised parts. I used some gold upholstery brads in a few places to add detail. I used a London England push pin from Ballard Designs to dress it up. The knobs I found! My husband bought our home from his parents. They downsized and moved, leaving some belongings in the house. After we married I found these in the garage. Score! This was a long post if you’re still with me, thanks so much! Kerry, Hi. After reading everything I understand completely why I confused you. It isn’t two steps. It is two different techniques. One on the drawers only which is the paintable wallpaper. And the rest of the dresser got the tissue paper technique. So the tissue paper and the wallpaper never meet. (well when it is all finished and I put the drawers in technically they meet up with each other, yeah that is how I confuse people) Okay so the wallpaper has all the raised beauty of the design when you buy it. It doesn’t need anything but a base coat and a coat of paint on the raised part, the design. So let’s talk about the tissue paper technique used everywhere except the drawers. That get this…paint a portion, while paint is wet, grab a piece of the gift wrap paper, make it into a ball, open it, spread it out, it will be a thin wrinkly paper now, and spread it out onto the wet paint, paint over it, (same paint,) paint another area (sq. foot size works well) and repeat until the whole thing is covered with your paint and paper. In small areas just tear the paper into smaller pieces before wadding into a ball. Let the whole thing dry…..crickets chirping….and then if you want you can have a small amount of paint on a cloth and rub to pick up the wrinkles. Did I confuse you more? If so message me privately on Facebook and I will give you my phone number and confuse you even more while we laugh about it all. I hope this helps and I have already tried to make it more clear in the post. Thank you so much Kerry for your interest!